Boss Chris Wilder says he will keep on sending his in-form players out with an attacking attitude - even if it does leave the Cobblers defence a little exposed at times. Table-topping Town are one of Sky Bet League Two’s great entertainers. They are the joint second top-scorers in the division alongside Saturday’s opponents Portsmouth having netted 37 times in 21 matches - a record bettered by only Carlisle United who have hit 39. On the flip side, the Cumbrians (37) are also one of only two teams in the top 10 to have conceded more than the 26 goals Town have shipped at the other end, with Leyton Orient (28) the other. Town have kept just two clean sheets in their past 14 league matches, but they have also lost only one of those fixtures. The Cobblers were involved in a seven-goal thriller at Luton Town on Saturday, but crucially they came out on top 4-3, and although Wilder admits it’s not the perfect way to win a match as far as a manager is concerned, as long as that match is won that is all that counts. 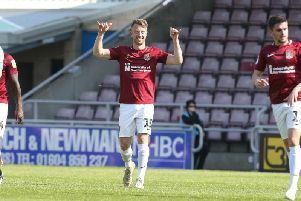 “We have talented players at the top of the pitch, and we go for wins,” said Wilder, who has seen his team win seven in a row in all competitions, and nine of the last 10 - the only blip a 2-2 draw at Newport County in a game the Cobblers were winning 2-0. “Our away record, especially recently, is first class and we are going for results. “In an absolute ideal world you would love to keep clean sheets and score three or four goals, but you need to score goals to win games. “You obviously need to keep the ball out of the back of the net as well, and we are a little disappointed with a couple of the goals we conceded on Saturday, and we could have defended a little better. “As I said, we have good players at the top of the pitch, I think our two central midfield players are attack minded and want to get on the ball and create, so we know that now and again we are going to concede.